How to Easily Master Format LG STYLUS 2 with Safety Hard Reset? How to Easily Master Format SONY XPERIA XA1 ULTRA with Safety Hard Reset? Hi, maybe you should try to do master format with microSD simcard firmware flash, please download firmware from Huawei official website, then follow steps to hard reset your Huawei Ascend Y300 using microSD card at #option 3 above. I have a odd issue which I really need some help with, I have a huawei y300-0151 and for some reason I cannot install any ROM on it, I had on slimkat and no matter how I wipe everything and try to install a new ROM it doesn’t work, it boots automatically into slimkat and there is a bootloop, and another thing my dalvic cache cannot wipe, I am getting errow message, please help me with this problem. Hi, unfortunately we can not give good advice to install custom rom at your Huawei Acend Y300, especially if that phone already get custom tweak before or rooted, because there are some not standard possibilities may happen. Please consult with Huawei authorize service center. Hi, maybe you can try to use microSD firmware flash with steps at #option 3 above. You have to download correct firmware source first from Huawei official website. How to fix if the lock screen turn to voice command to enter the pasword.it does’nt change in to text type. I fed up wid my huawei ascend y300..bcz..evertime its showing “unfortunately huawei input method has stoped” and othr apps are has stopped..like dis..wot can u do? Pls help me!! Hi, usually the problems like this happen because some applications crash and make trouble or make corrupt your Huawei Ascend Y300 os. 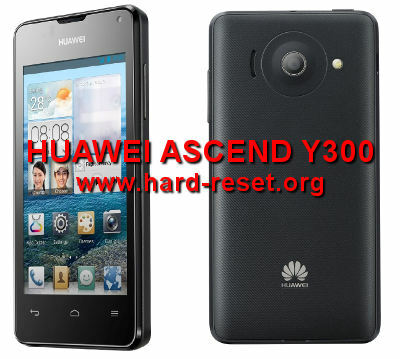 Please backup all important data, then try to do hard reset to reformat your Huawei Ascend Y300 operating system to factory default, after format finish, you have to setup again your Huawei Ascend Y300 like new or like the first time using this phone. I have encountered an “encryption unsuccessful” message requiring me to do a factory reset of my Huawei Y301A2 phone. Using the power + volume up buttons I get a “mount data fail” and a reboot returns me to the original encryption unsuccessful message. Ideally I seek a tool that allows me to USB plug my phone into my computer. Such that the tool scans the phone and based on the scan results the tool will handle the entire factory reset process??? If no such tool exist, any alternative suggestions are greatly appreciated. Hi, you should try to reformat your Huawei Ascend Y300 using microSD flashing data like steps at #option 3 above. You should download Huawei Y300 data first from Huawei Mobile website and choose the correct version, then follow steps at #Option 3 above to reformat your Huawei Ascend Y300 operating system to factory default. Hi, if you have tried hard reset, but the problem still not go away, then please consult to Huawei authorize service center for further check. Hi, at this problem, we suggest to do hard reset to reformat your Huawei Y300 operating system to factory default. Usually this problems happen because applications corrupt, then it will back to normal again after reformat the operating system. Hi, we can not make sure whether your Huawei Ascend Y300 got troubles because if the way you have done for your audio jack port. However, if anything can not work, then your should try to do hard reset first hardware button combination key or using MicroSD firmware flash with one of the following options above. If still can not work, then maybe the hardware got trouble. You should bring to Huawei authorized service center for further check.